For regional stakeholders, this Guide presents the eDIGIREGION Regional innovation Benchmark Audit tool, its structure, how it can be used, what data is required, and how to perform a Regional Innovation Benchmark Audit. The Guide also provides a set of tried and tested methods for engaging with regional stakeholders, gathering and analysing the innovation benchmark audit data. 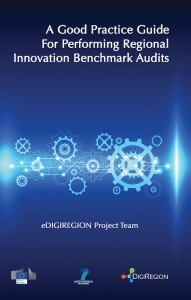 The Guide further illustrates the functionality of the tool by providing four case studies as to how the eDIGIREGION Regional Innovation Benchmark tool was used in South East Ireland, central Hungary (Budapest), Bucharest-Ilfov, Romania and Castilla-La Mancha, Spain. Performing a comprehensive Regional innovation Benchmark Audit is a foundation step in designing and implementing a region-specific Joint Action Plan to develop sustainable entrepreneurial regions and regional innovation ecosystems.